Gilt provides instant insider access to today’s top designer labels, at up to 70% off retail. Become a member and find something new every day for women, men, kids, and home as well as exclusive local services and experiences and luxury travel. Their program seemed and looked quite promising. There are even case studies out there that show how their referral program helped them bounce back from dropping sales. But sadly, their dual-sided program no longer exists, knocking it’s score down to a ‘C’. The program tracked referrals through personal links but used a static promo code for all. 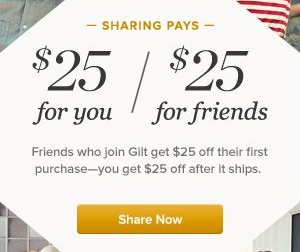 The program offers a pretty good sized dual-incentive of $25, which is pretty enticing considering the deals they have in the e-commerce shop.